Ciara Judge, Emer Hickey and Sophie Healy-Throw scooped first prize for their research into the effect of bacteria on plant germination. The three Kinsale Community School students at their stand explaining their research yesterday. THE WINNERS OF Ireland’s Young Scientist competition have won top honours at the overall EU contest in Prague. Ciara Judge, Emer Hickey and Sophie Healy-Throw scooped first prize for their project on the effects of a specific bacteria on plant germination. The students from Kinsale Community School in Cork were one of three winners to share the first prize at the European Union Contest for Young Scientists this afternoon. The other first prize winners came from Finland and the United Kingdom, with each of the winning teams receiving €7,000. A total of 126 students aged between 14 and 21 took part in the annual contest, representing 37 countries. It is the second year in a row that Irish students have shared the top prize. Over the period of 11 months, the girls tested almost 10,000 seeds and took thousands of manual readings. Their research found that two types of the bacteria accelerated the germination rates of barley, which could help farmers to increase their yields. Máire Geoghegan-Quinn, the European Commissioner for Research, Innovation and Science praised the mixture of “curiosity-driven research and more applied projects” at this year’s EU contest. “We need more young people to take up STEM subjects at school, and I especially want to encourage more young women to pursue careers in science and technology,” she said. Email “Congrats! Ireland's Young Scientist winners scoop first prize at EU contest”. Feedback on “Congrats! 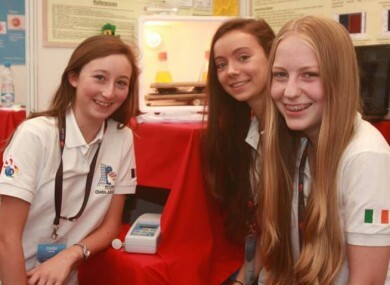 Ireland's Young Scientist winners scoop first prize at EU contest”.